Wooden ceiling of the circular courtyard and double gallery of the Palace of Charles V, La Alhambra. 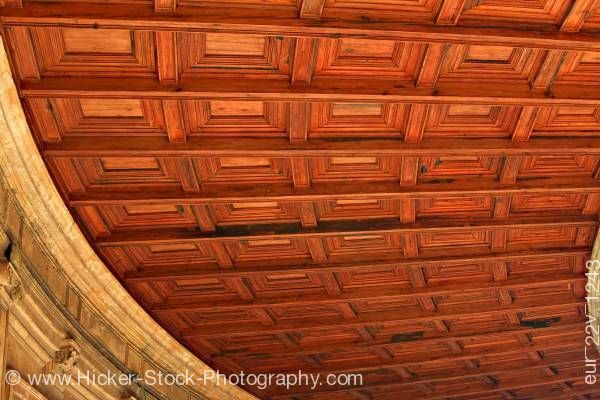 This stock photo shows the rich details of the wooden ceiling of the circular courtyard and double gallery of the Palace of Charles V (Palacio de Carlos V), The Alhambra (La Alhambra) - designated a UNESCO World Heritage Site, City of Granada, Province of Granada, Andalusia (Andalucia), Spain, Europe. The rich color of the wood in the ceiling adds to the contrast of the stone walls. The deep red tone of the wood is made into layers giving more depth to the ceiling. Each square panel is framed with additional squares becoming smaller towards the ceiling for a dimensional look. The wooden ceiling of the circular courtyard and double gallery of the Palace of Charles V (Palacio de Carlos V), The Alhambra (La Alhambra) - designated a UNESCO World Heritage Site, City of Granada, Province of Granada, Andalusia (Andalucia), Spain, Europe.